How David’s character was in Prometheus? The android David played by Michael Fassbender in Prometheus is such that will make you root for him and at the same time not trust him completely. His childlike behaviour and the curiosity to know about the surrounding and the people around is something that makes his character look innocent. There are parts in the movie were David goes into a complete sociopath mode and all he wants is to seek the ultimate truth behind life as directed by Weyland Corporation. So, should David’s character be considered to be untrustworthy and bad? Perhaps the two years of solitude life that David spends in Prometheus when the other humans were resting in the cryosleep is what he had to himself when he enjoyed studying, learning, thinking more about humans and the likes. Read more about cryosleep at https://www.nasa.gov/content/torpor-inducing-transfer-habitat-for-human-stasis-to-mars/#.VvV_d0dRKtY. Everything went smooth until all the humans wake up from their long slumber and suddenly making David realize that he was not a human and had no soul. But I would rather say that David was more than just being an android. During his solitude time, he evolved and developed many human characteristics which obviously he was not programmed to do. There were numerous comments over the internet cursing David and as he did whatever he wished to, there was something within David that drove him towards his goals. Elizabeth Shaw was the only person about whom David seemed curious and we all know his faithfulness until that very point. The role of David was that of a thankless crew and in fact Dr. Shaw was the only one who said him ‘Thank You’ when he saved her life. He even confessed to Shaw about intrusively watching her dreams while she was asleep during those two years span. The unhidden agendas of David and his curiosities made him an unpredictable and suspicious character throughout the movie. 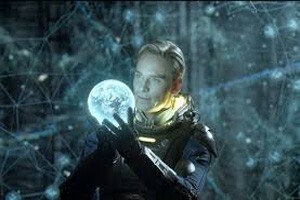 Click here to read more about the movie Prometheus. A closer look into Prometheus 2 | Will Prometheus 2 will in the gap? Will Prometheus 2 will in the gap?